The South Bay legal community is bracing for chaotic days ahead in county courthouses as Superior Court clerks go on strike Wednesday morning. The work stoppage is sure to impact virtually every facility in the Superior Court of Santa Clara County, and members of the clerks union also plan to organize picket lines at the Hall of Justice in San Jose. Court management said in a release Tuesday it's not clear how many workers are participating in the strike but that the court will scale its operations according to legal mandates and available resources. That could include legal action by the county to force some of the clerks to work for the sake of public safety, sources say. "If people can't have their cases heard that are pending cases while they're in custody, they may have to be released from custody, which could create a public safety concern," said Steven Clark, a legal analyst. 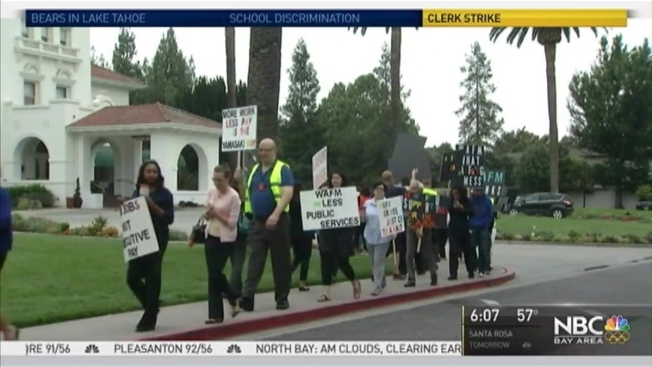 Court management submitted 24 names of clerks it may seek to force back on the job, and the union has relented on five, NBC Bay Area has learned, though some court officials insist it could be seven. Regardless, the court says there are no plans yet to seek injunctive relief. For other proceedings, such as requests for court records or other court files, people should expect longer lines due to the staffing shortages, the court said. San Jose resident Gene Delaplace, who is in a legal fight over a mortgage foreclosure, had to file paperwork with a court clerk, and to his dismay, he found out he must return Wednesday with more papers. "The clerks will be on strike. What do you think is going to happen?" he said. "I'm probably going to have a longer wait tomorrow." The Superior Court Professional Employees Association said many of its workers haven't had a pay raise in eight years, and they've been working without a contract for two years. They've been offered a 4.5 percent raise this year and last, along with an immediate 5 percent raise this year, all of which the union turned down. Court management has said it is operating under a $5 million budget deficit. The clerks authorized a strike last month, and their efforts to continue negotiations were rebuffed. A letter indicating their intent to strike was sent to court management Monday. "You may see the remaining court clerks or supervisors have to go over to criminal to stop the gap problem there," Clark said. "And all of the traffic and family type cases, all of which are important to the citizens, will be put on hold." Court management acknowledged as much in its contingency plan. Clerks offices will be closed in Morgan Hill, Palo Alto and Sunnyvale, with limited services for the Hall of Justice and its criminal proceedings. Clark said if all doesn't go as planned, "you'll have chaos in the criminal justice system." Below is the breakdown of limited services at each facility, according to the court's release. For more details, visit the court's website. DTS/Old Court House (Civil/Probate) – Clerk’s Office will have limited services. Matters will be heard as staff is available. Hall of Justice (Criminal) – Clerk’s Office will have limited services. Matters will be heard as staff is available. Notre Dame Courthouse (Self Help/Child Support) – Self Help Center will remain closed as is the normal practice on Wednesdays. Clerk’s Office will be closed and customers will be redirected to Family Court located at Park Center Plaza. Matters will be heard as staff is available. Morgan Hill (Criminal) – Clerk’s Office will be closed but a drop box will be available. Matters will be heard as staff is available. Palo Alto (Criminal) – Clerk’s Office will be closed but a drop box will be available. Matters will be heard as staff is available. Park Center Plaza (Family) – Clerk’s Office will have limited services. Matters will be heard as staff is available. Santa Clara (Traffic) – Clerk’s Office will have limited services. Hearings will be taken up as staff is available. Sunnyvale Courthouse (Family) – Clerk’s Office will be closed and customers will be redirected to Family Court located at Park Center Plaza. Matters will be heard as staff is available. Terraine/Guadalupe (Drug & Mental Health/Juvenile Dependency) – Clerk’s Office will have limited services. Matters will be heard as staff is available.